SOMERVILLE -- For 81 minutes on Tuesday afternoon, the Tufts University women's soccer team threatened to break through the Keene State College back line. In the last nine minutes, they did it twice. The Jumbos battled hard in their home opener and walked away with a 2-0 victory over the Owls at Kraft Field. Speedy senior Cara Cadigan (Nahant, MA) beat her defender to a ball through the middle of the field and was left free to slam it into the back of the net to give Tufts a 1-0 lead with just under ten minutes remaining. The assist went to sophomore Jamie Love-Nichols (Cortez, CO), who played her beautifully into space. Cadigan and Love-Nichols had been leading the Jumbos offensive attack all afternoon, each firing four shots at Keene State goalie Meghan Dempsey (East Weymouth, MA). 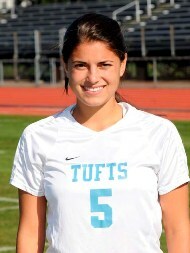 Six minutes later, Ali Maxwell (Exeter, NH) put the game on ice for Tufts with a great individual effort. Alone in the right corner, the senior found herself with the ball after it deflected off of an Owls defender. With no one in the box, Maxwell curled the ball towards net, depositing it in the top shelf and putting Tufts two goals ahead with very little time for Keene to comeback. Tufts had threatened to take the lead in the 24th minute, but Maxwell's header clanged off the junction of the post and crossbar. Despite a flurry of shots from the home team, the Owls hung tough in the first half, and reached the break with the game scoreless. Dempsey played well in goal for Keene State, stopping seven shots overall and keeping her team in the game. In the 57th minute, she scrambled off her line to stop a break-away attempt by Love-Nichols and kept the game scoreless. In the end, however, Keene State could muster only one shot on goal, giving Tufts' keeper Kate Minnehan (Hopkinton, NH) very little trouble during a shutout win. The Jumbo backline played stalwart defense all afternoon, particularly sophomore Cleo Hirsh (Hull, MA), who battled up and down the field for 90 minutes. Cadigan, Love-Nichols, and Maxwell all collected their first points of the season for the Jumbos, who evened their record at 1-1. The Jumbos will host Amherst next Saturday, while Keene State, now 4-2, travels to Plymouth State.